A few years ago I scheduled a spring Yosemite workshop to coincide with a 3% crescent moon that I’d computed would slip into the narrow gap between El Capitan and Half Dome about 45 minutes before sunrise on our final morning. Though we were all at the same place, photographing the same thing, the true magic was simply being there to witness a special moment that probably won’t repeat for decades. The afternoon before this moonrise, I brought the group to this spot on Big Oak Flat Road so they could familiarize themselves with the location and plan their compositions. During this preview someone asked exactly where the moon would rise, and I confidently blurted that it will appear in the small notch separating El Capitan and Half Dome, between 5:15 and 5:20 a.m. I’d never actually photographed a moonrise from this spot, and as I spoke to the group I became painfully aware of how small the opening is—even the slightest error in my plotting could find the moon blocked by El Capitan or Half Dome. Sunday morning we departed dark and early (4:45 a.m.), full of anticipation. 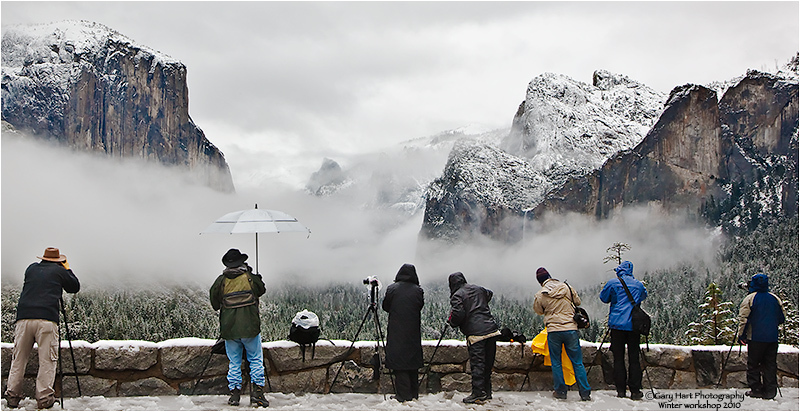 We arrived at Half Dome View a little after 5:00, early enough to enable everyone to set up their tripods, frame their compositions, and prepare their exposure settings. Then we waited, all eyes locked on the notch. 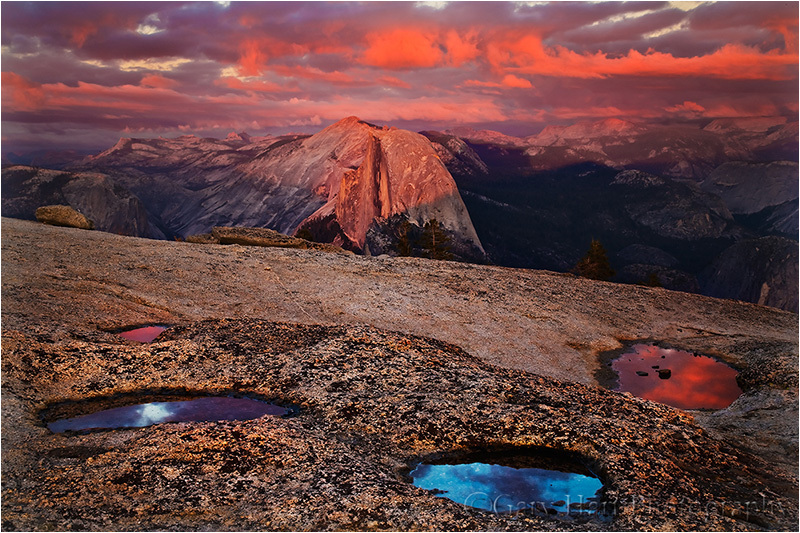 And then there it was, the slightest point of moonlight edging into that small gap between Yosemite’s iconic monoliths. Phew. The rest of the morning was a blur of shutter clicks and exclamations of delight. Spend enough time on Facebook and Instagram and you get a pretty good idea of what it takes to make a picture that generates attention. The unfortunate consequence is a photographic feedback loop, where one ostentatious image inspires more similarly ostentatious images, which inspire more…, well, you get the point. This uninspired feedback loop reminds me of top-40 music, where one groundbreaking success generates a flood of uninspired clones. Catchy tunes are fine for a few listens, but few possess staying power. Contrast that to the Beatles, who aggressively resisted repetition and pursued new sounds that the world has been listing to pretty much nonstop for more than 50 years. Admittedly, few artists are blessed with the Beatles’ creative genius, but that’s no excuse to shortcut creativity. The same holds for photography: images that elicit a reflexive Like and Share from digital passersby, and maybe (if you’re lucky) a “Stunning!” in the comments section, are forgotten with the next click. But images that resonate on a personal level by revealing something unseen, or by touching a hidden place inside the viewer, not only stop people in their tracks, they grab them and don’t let go. Of course this sounds great in theory, but how is it accomplished? If the answer were easy, we’d all be doing it. But like Dorothy and the Ruby Slippers, perhaps we’ve had the power all along. Because most people long for a connection with the world around them—not simply a connection with nature, but more importantly a connection with kindred souls—a good place to start would be to give viewers of your images something of yourself to latch on to by concentrating on subjects that resonate with you. My own photography took a huge leap forward when I started photographing simply to please myself. The more I pursue moments in nature that touch me personally, (as if by magic) the more unique, gratifying, and successful my images became. While my most personal images don’t please everyone, the people they do reach seem to feel a deeper connection than they do to my images intended to impress. Familiarity is the first step toward intimacy. With many picturesque trees and hills to work with, on this evening (as with many shoots) my compositions started wider, but didn’t seem to be about anything. But as the moon fell and the light faded, the scene’s essence began to materialize. So what moved me to this composition? At the time it was enough that the scene finally felt right. But given the benefit of time and introspection, even though the moon and tree share the same frame, each is isolated: the tree is grounded in its terrestrial world, while the moon soars in its celestial world. I’m writing this at Starbucks, very much by myself, but in the company of a dozen or so other people similarly isolated at the center of their world. It occurs to me that the shared isolation of the tree and moon makes a great metaphor for the human experience. On the other hand, maybe it’s just a pretty picture….